Aircraft icing has resulted in numerous accidents, some fatal. The problem is due, in part, to a lack of awareness on the part of aviation forecasters (and others) that icing is imminent. 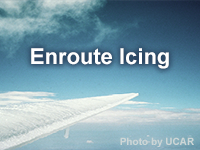 The lesson addresses this issue by presenting a process for forecasting enroute icing for aviation and applying it to a case over the Continental U.S. The process involves gaining situational awareness of potential icing areas and making a first forecast of their locations and flight levels; comparing the first forecast to NWP forecasts; and adjusting as needed. To reach a wide audience and stay current, the process goes up to the point of issuing products and warnings. The lesson is aimed at aviation forecasters in the United States National Weather Service’s aviation facilities although international aviation forecasters should benefit from it as well. It was good, but a bit confusing when it talked about the FIP maps, mainly because I have never worked with those products. Great mod, however some questions could be clarified. I like so much this course! It was very helpful, specially with the understanding of icing represented on radars.